Looking for a fun & FREE way to experience the Aquarium of the Pacific tomorrow? 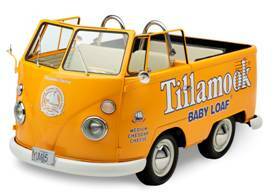 Be one of the first 100 people to spot the Tillamook Baby Loaf Bus in front of the Aquarium of the Pacific tomorrow morning and check-in (starting at 9:00 am). You must be wearing an Orange shirt and you will get one free entry per person. Tillamook Cheese is celebrating its Loaf Love Tour which includes sponsoring the Grilled Cheese Festival Invitational on April 23rd in Los Angeles. The Aquarium of the Pacific is located at 100 Aquarium Way, Long Beach, CA 90802 and their website is here. You can get more information about other Tillamook Events by becoming a Fan here or following them on Twitter here. So will you be grabbing an Orange Shirt and heading down to the Aquarium of the Pacific tomorrow?